With "Samba for beginners", Dudu picks up on a lot of beginners’ requests for an introductory workshop on Brazilian music. For drummers/percussionists with little or no to some previous experience, the individual instruments will be introduced and their playing techniques for the most important Brazilian rhythms practiced - taking enough time for everybody to really get the basics. 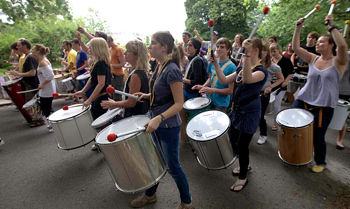 The purpose of "Samba for beginners" is for participants to be able to acquire the basic skills required for use in any Samba group, skills that can be expanded on and refined as desired. Berlin also provides a lot of opportunities to hear top-class music of all genres or to enjoy an evening of socializing in one of its Brazilian bars.